Information professional specializing in digital asset management (DAM), with a background in graphic design and experience across the pharmaceutical, CPG, publishing, library, museum, and education fields. Passionate about leveraging technology to connect people with the information they need to get their jobs done more effectively. Enjoys helping organizations reap the rewards of effective information management: saving time and money through operational efficiencies, content reuse, and reduced liability while speeding time to market, driving effective data analysis, and enabling critical business decisions...all in a day's work! Creating and evolving global end-to-end content management capabilities, with an emphasis on driving strategy/operations and maximizing growth and reuse of global marketing, promotional, and medical content. Previous member of an embedded Global Content Automation team focused on production, management, and reuse of Merck's global modular pharmaceutical marketing/promotional content. Served as Digital Asset Management Lead on Campbell’s first DAM initiative, including the development and deployment of an enterprise level DAM system. Managed and administered Campbell's library of over 115,000 packaging/brand assets, and optimization of associated workflows and operations. Digitized rare natural history materials to expand access to library and archival collections. Cataloged born digital images within the museum's marketing DAM system. 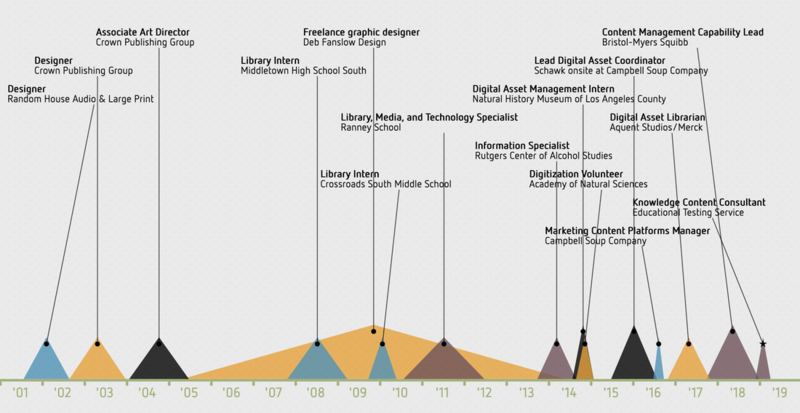 Participated in the library's digital initiatives, website development, and library services. Managed the Paulus Library media program, centered on collaborating with faculty to increase information literacy skills of students in grades 6-12. Worked closely with school librarian to develop skills in instruction, information management, collection development, and program administration. Mentored by an award-winning school librarian in every aspect of managing a school library media center. Collaborated with publishers, editors, sales, marketing, publicity, and production departments to design and art direct visually effective and bestselling book cover designs — on-time and within budget. Worked closely with art directors to design original hardcover and paperback book covers while executing and trafficking revisions to mechanicals for all Crown imprints. Designed audiobook packaging and book jackets while managing freelance staff and coordinating production schedules for five imprints. Designed advertising and promotional materials in support of marketing and publicity programs for 9 imprints. Designed print and online promotional materials while adhering to established corporate identity standards. Assisted with design and production of print materials for an independent design studio. Assisted with production and image asset management to meet weekly editorial deadlines. Assisted with proofreading, typesetting, and administrative tasks for a scholarly press. Development of a new knowledge base of documentation for ETS's flagship item banking information system. Curation and governance of the largest library of DAM resources on the web. Co-Founder and Co-Organizer of the premier professional group for DAM professionals in NJ. Active participant in creating and furthering standards and best practices within the DAM industry. Founder and Co-Chair of the new SLA DAM Section, organized to provide a bridge between DAM professionals working across the commercial and cultural sectors. Responsible for administering and maintaining the chapter website and digital technologies.